Sometimes it’s time for a switcheroo. I’ll reorganize my nonfiction bookcase, or my mom will plant new flowers around her house, or my cat will suddenly start sleeping on a new corner of the sofa for no reason. You might have reasons behind it, or you might just feel like a change. Maybe for you—whether for money, maintenance, or just a plain ol’ change of pace—your vinyl liner pool is the subject of that change. At River Pools we manufacture and install fiberglass pools, and several times each year, we replace vinyl liner pools with fiberglass units. Our clients are thrilled with the results, and with fiberglass pools gaining market share every year, we expect to take on more and more of these replacement projects. If you want a refresher, our cost and pricing guide for inground swimming pools compares the upfront and long-term costs for buying concrete, vinyl liner, and fiberglass pools. However, replacing an existing pool has slightly different methods and therefore slightly different expenses. 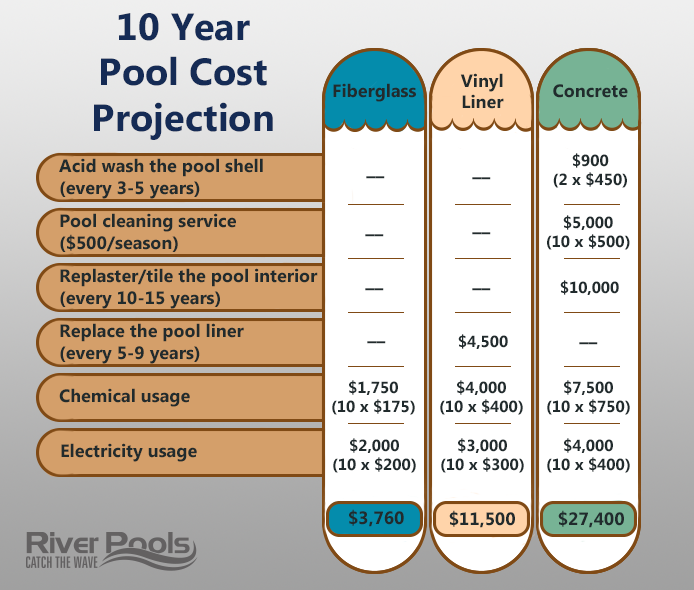 On average, it costs $50,000–$65,000 to replace a vinyl liner pool with a fiberglass unit. For reference: that’s $3,000–$7,000 more than installing a fiberglass pool normally. The thing is, vinyl liner pools are usually bigger than fiberglass pools. 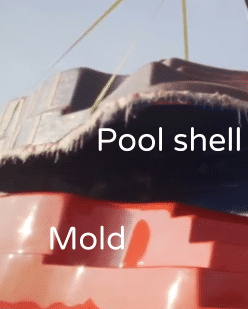 Therefore, the hole from the vinyl liner pool is usually bigger than the fiberglass pool shell. We have to bring in additional stone backfill to fill in that extra space. Also, it’s more difficult to get to a preexisting pool site. We almost always have to work around a patio, fence, and landscaping. How long does it take to replace a vinyl liner pool with a fiberglass pool? Replacing a vinyl liner pool usually takes about the same time as a regular fiberglass pool project: 3–6 weeks, not including the time to get a permit. 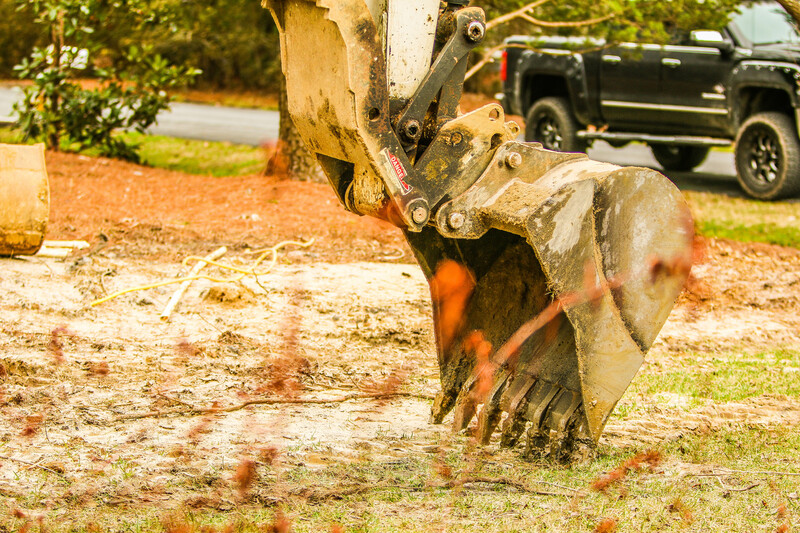 It takes 2–3 days to excavate, dig, set, backfill, and form. The concrete pour and form removal will take another 2–3 days. It can be longer for stamped concrete, which is colored and sealed. Cleaning, grading, and covering will take 2–4 days. Installing a new patio and fancy features fills in the rest of the time, as usual. Can I replace the vinyl liner pool with a fiberglass pool myself? While this project could potentially be a DIY for someone with a lot of experience, it’s generally best to have a professional do it for you. This decreases the likelihood of error. By hiring a professional, you also avoid big stressors such as coping disasters, misleading prices, and responsibility as general contractor for permits and all sub-contractors. Whether you go with a professional pool installer or a DIY project, do all your research and cover all your bases before making that big final decision. Should you replace your liner pool with fiberglass? It comes down to whether a vinyl liner pool or a fiberglass pool is a better fit for your family and your needs. If you already have a vinyl liner pool, you know they are less expensive upfront, and they are available in customized shapes, unlike fiberglass pools, which are manufactured on preexisting molds. However, with a fiberglass pool, you no longer have to replace a liner every 5–9 years. Because there’s no liner (and the accompanying seams), the pool has less chance of leaks. You no longer have to worry about liner punctures from tree branches or dog claws. You have the option of integrated steps, ledges, and benches. You can add other neat features, such as waterline tile, that a liner wouldn’t allow. A fiberglass pool requires less maintenance and is easier to maintain. Bonus: this extrapolates to lower lifetime costs. At River Pools we manufacture and install fiberglass pools in Virginia and Maryland, and throughout the US via our dealers. If you would like to find a dealer, or if you live in Virginia or Maryland and would like to talk to us about replacing your vinyl liner pool, we’d love to hear from you. We’re excited to help you on your pool journey! 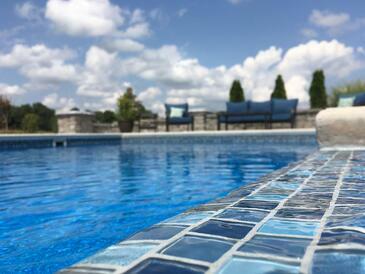 Do you have any other questions about the process of buying the perfect fiberglass pool? Dive into our ebook—it includes all the details you’ll need to make the best decision for you and your family!